As a mostly-vegetarian (and especially during this time in my life when I’m nursing babies), I find that one of my challenges is getting enough protein without overdoing it in the fat/calorie department. (Not that I’m OPPOSED to overdoing it in the fat/calorie department–but, you know, moderation in all…nah, scratch that.) So anyway, I am tentatively experimenting with things that I don’t normally consider food, like egg whites from a carton–which I can only bear to do because our chickens have stopped laying for the winter–and low-fat cheeses. So if that sounds terrible to you, stop right here and skip to the soup below. But if you’re looking for a way to add protein to your diet and/or cut back on fat and calories, this frittata isn’t half bad. 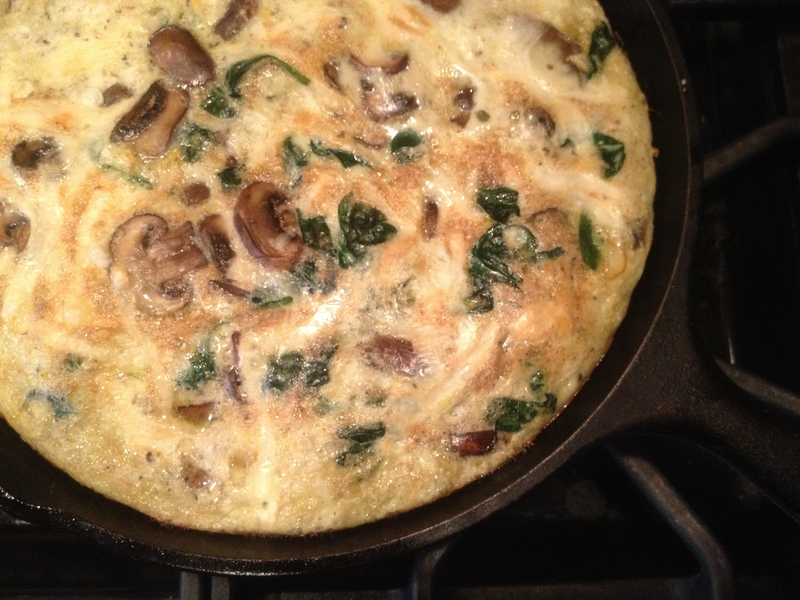 A Spinach-Mushroom-Swiss Egg White Frittata could really have any combination of veggies and cheese, of course, but here’s what I did: Cook nearly a pound of mushrooms like crazy over high heat in a little olive oil until they release their liquid and it evaporates and they get nice and brown. Then and only then, add a pinch of salt, then some handfuls of spinach, then another pinch of salt. 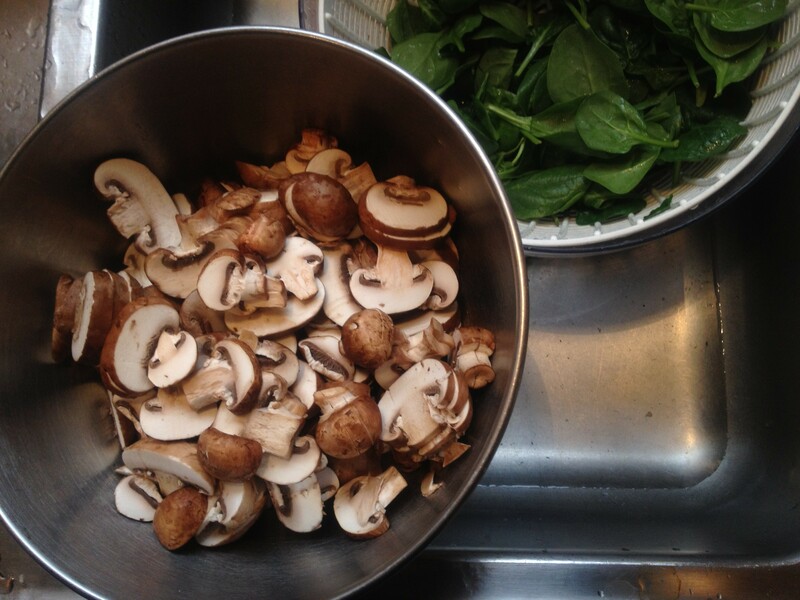 When the spinach wilts, take the pan off the heat and scoop the veggies into your waiting bowl of 16 oz. egg whites beaten with 4 whole eggs, more salt, a splash of water and 4 shredded slices of lite Jarlsberg cheese. Return your pan to a medium-low burner, wipe it out and add a little more olive oil, and pour in the whole mixture. Once the edges of the frittata have set, I like to transfer the pan to a hot oven to finish baking, then brown the top by flipping on the broiler for a well-supervised minute or two. This was lunch today on a slice of toast with a drizzle of lemony, salty harissa oil–and it will be breakfast for the rest of the week. To recover from my slight queasiness over the very idea of low-fat cheese, I needed a good honest lentil soup for dinner. This is a pure, clean recipe, courtesy of Alice Waters from her book In The Green Kitchen. Of course, I doubled the recipe, because you know how I feel about soup–and about leftovers. Both divine. 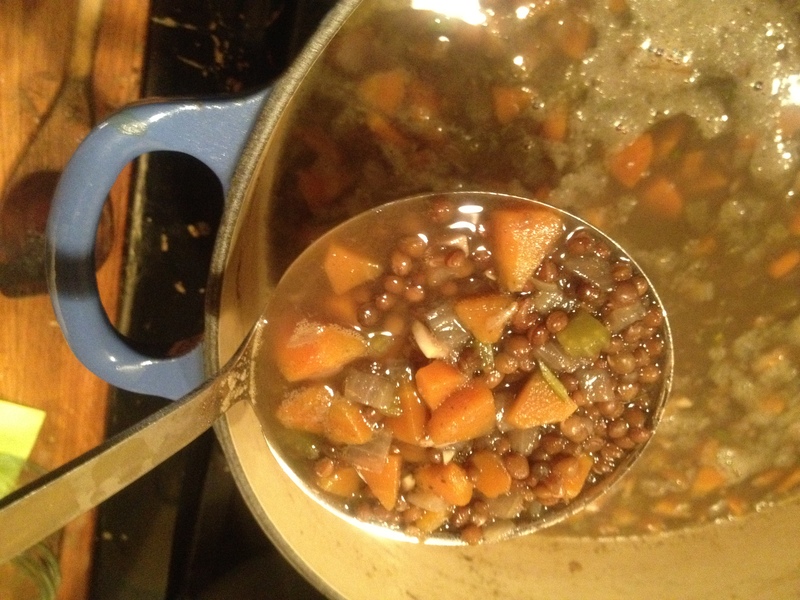 Lentil Soup with Rosemary: Finely dice 2 small onions, 4 ribs of celery, and 4 carrots. Sautee with a tsp. salt until the onion is lightly browned, then add 6 big cloves of chopped garlic and the chopped-up leaves of a big branch of rosemary. When these additions become fragrant after a minute or two, add 2 c. sorted and rinsed tiny black or French green lentils, 3 1/2 quarts of water, and another Tbsp. salt. Bring to a boil and simmer until everything is very soft, about an hour. Season to taste with salt and black pepper and serve each bowl with a dollop of greek yogurt. This entry was posted in Beans and Other Legumes, Breakfast, Easily Multiplies to Feed a Crowd, Eggs, Soups, Vegan or Would-Be-Just-As-Good-Vegan and tagged breakfast, cooking, dinner, recipes, soup, vegetarian on January 9, 2012 by emmycooks.